I didn’t have many nice things to say about the terrible Insteon hub, but let’s go the other way and gush about how great the ISY994i integration is with the Amazon Echo . Connected Home devices are a bit more of a special tier where you don’t have to actually use an “invocation name”; you just say something like “Alexa, turn on the kitchen light.” Vendors like Phillips Hue and Samsung Smart Things are included in the list of devices that fall in this category. 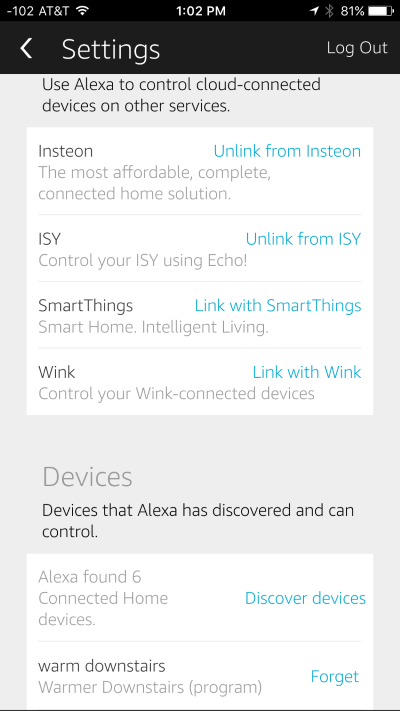 Sadly, Amazon’s link for Insteon devices only lists the Insteon Hub and not the ISY – but the ISY is also supported and exposes “connected home devices”. A subscription to the ISY Portal. This is required to bridge the communication between Amazon services and your ISY. 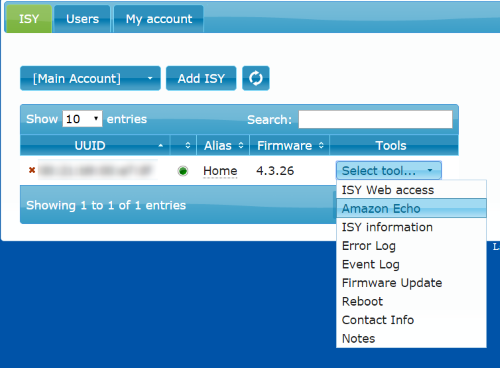 Use “Help:Purchase Modules” in your ISY interface to sign up; at $50 for 2 years it’s a bargain! Link your my.isy profile to your Amazon account, and link the Echo app back to allow communication between your Amazon Echo and ISY994i. We then show that the skill is still being fine-tuned – controlling the thermostat through the skill is still a little rough. Next, we use the Amazon Connected Home feature to turn off the lights without needing the invocation word “izzy” (“Alexa, turn off the kitchen lights”). 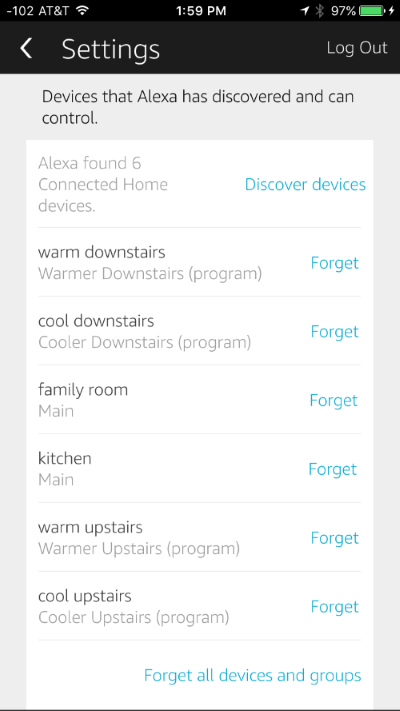 Notice how the response is different for the Connected Home control (Alexa just responds with “OK” rather than a full voice response) – not a big deal, but presumably that’s because the API is more restrictive for these devices so that the user experience is the same across all devices (i.e., Hue, ISY, etc.). The result of this program will be the thermostat goes up if you say “Alexa, turn on downstairs thermostat”, and goes down if you say “Alexa, turn off downstairs thermostat”. Yes, the grammar is a bit funny for now, but this will no doubt get better over time! I wish I had seen this sooner. Can’t wait to get home and try this out! That’s pretty much what I was hoping to hear after UD announced the Alexa portal integration. I just didn’t want to fork out the money if I wasn’t sure. How is it with dimming controls? Is it something like “Alexa, turn the living room lights to 50%”? 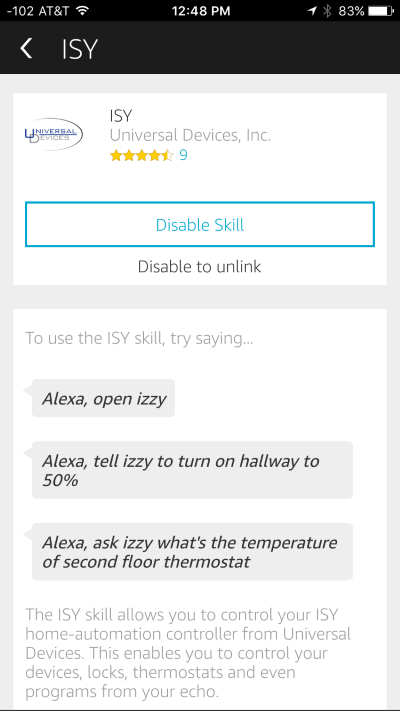 I didn’t have much luck with either the skill (“Alexa, ask Izzy…”) or connected home devices setting dim levels to specific numbers, although I was working with scenes. 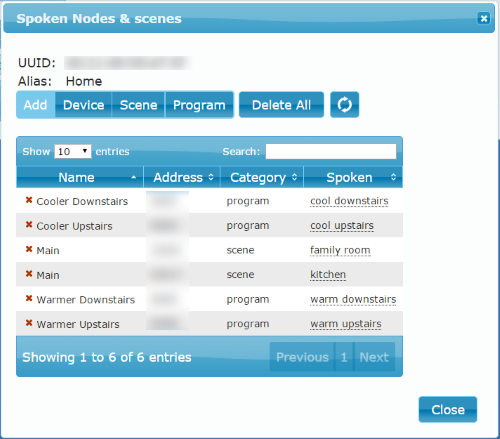 I was able to use either to dim or brighten a scene (“Alexa, ask Izzy to dim the kitchen” or “Alexa, dim the kitchen”), but got an error with connected devices (“That command is not available”) and the skill (“That device is not dimmable”) when trying to set to an absolute value. Still, you could create different scenes (“Bright Kitchen”, “Dim Kitchen”) and map each of them to get to the dim level you want with a single command. When I found out the Echo now worked with my Isy, it gave me the reason I was looking for to buy one. I found it easy to set up and have thoroughly enjoyed setting it up and using. The Echo has been a great way for my wife it interact with the Isy controlled devices naturally for the first time. A success all the way around! Hi Matt, Love your blog. Can’t wait to hear your opinion of the new MobiLinc skill in Echo. Will definitely keep an eye out for it. So far MobiLinc has focused a lot on HomeKit (Apple/Siri integration) and I haven’t seen anything related to the Echo yet. Is it possible to query Alexa about the state of a device? I have an Echo only since 1 week and just bought ISY994i ZW which arrives in a couple days and eager to start playing with it.